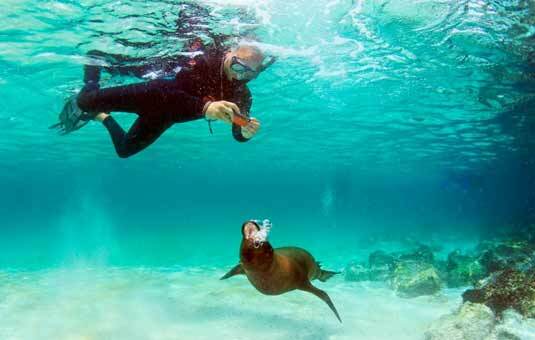 Visitors to the Galapagos Islands expect to see amazing creatures crawling, flying, or basking on the islands. But what surprises many people is the abundance of life just off the shore line, only a few feet down in the water. There is a world teeming with schools of angelfish, gliding manta rays, docile white-tipped reef sharks, and feeding marine iguanas. With only a snorkel, fins, and a mask, you have a movable window into the underwater world, observing marine life face to face, from magenta octopus to graceful sea turtles and paddling penguins. Almost all boat tours offer snorkeling as an integral part of their itineraries, but some boats may charge an extra equipment rental fee. Also, the quality of snorkeling equipment may vary widely amongst boats. All cruises and land based tours in Galapagos Islands .com are coordinated by licensed Galapagos National Park guides and are highly knowledgeable about the underwater wonders of the Galapagos.